Northumberland really is the land that’s just as good with the lights off! As the location of one of the largest Dark Sky Parks in Europe, the stargazing possibilities are endless. From expert-led observatories to Dark Sky Friendly accommodation, you can choose from guided stargazing sessions to just getting out into the great outdoors and looking up! If you’re keen to stargaze for less, try a Dark Sky Discovery site. These sites are easy to find and some even have star maps in place to help you to find key stars and constellations. Many have 24-hour toilets and places to eat and stay nearby. Completed in the summer of 2014, this community space represents more than just a place to access the night sky. The structure was designed by students from Newcastle University’s School of Architecture, after careful consultation with the Kielder Art & Architecture team and the Stonehaugh village community. It uses recycled material and, as well as being functional, is a striking piece of architecture. Thanks to the Pavilion’s location within the Northumberland National Park, the sky above it falls under the protection of the Northumberland International Dark Sky Park. This makes it an ideal place to while away the hours as the shadows lengthen, the evening deepens and the stars appear. Parking is available at the nearby picnic site. This is another community space designed by the students of Newcastle University’s School of Architecture in collaboration with Kielder Art & Architecture. Sitting on the site of the old Brigantium roundhouse in the Redesdale valley, the Rochester Roundhouse features an external amphitheatre space developed from the old roundhouse walls, with the pavilion mimicking this curve to provide a simple and elegant internal space. Deep within the heart of the Northumberland International Dark Sky Park, this wild and remote landscape was once the stomping ground of the infamous Border Reivers. Now it is a tranquil idyll with wide, inky black skies. Ingram is located in the beautiful and remote Breamish valley of the Cheviot Hills, high in the north of Northumberland National Park. 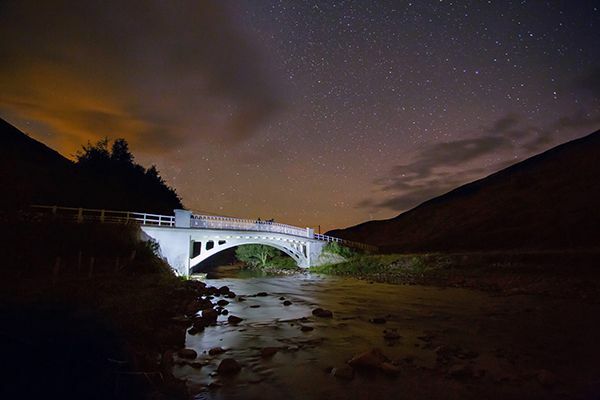 Impossibly picturesque by day, Breamish Valley is a stargazer’s dream spot. You’ll feel like you’re the only person for miles – perfect for taking in the magnificence of the vast night sky above you. From towns and cities, you see just a handful of stars, but in the remote Breamish Valley, you can see up to 2,000 at any one time! Parking is located at nearby Bulby’s Wood. This car park and surrounding grasslands area sits on the banks of the shallow River Breamish, so care must be taken close to water’s edge at night. The North Pennines Area of Outstanding Natural Beauty (AONB) Partnership has commissioned a brand new observatory as part of its Allen Valleys Landscape Partnership Scheme, supported by the Heritage Lottery Fund (HLF). Designed to be sympathetic to the landscape, we can’t wait to see how it will look!